Anyone that’s tried to find information on public hunting area locations in Illinois has likely grown tired of clicking through the alphabetical listing wondering where exactly each property is located, Googling site names, nearby locations, and deciphering poorly worded directions listed in the Fact Sheets and attempting to read badly drawn, inconsistent maps of the properties. We’ve taken the guess work out of it for you and compiled a map listing of all public hunting areas in the state with links to each property’s fact sheet. Now you can simply browse a map, showing each public hunting area in one convenient location. Whether looking for a new waterfowl hunting area, timber for deer hunting, or managed sunflower filled fields for doves, this map can help identify new public hunting land in your area. 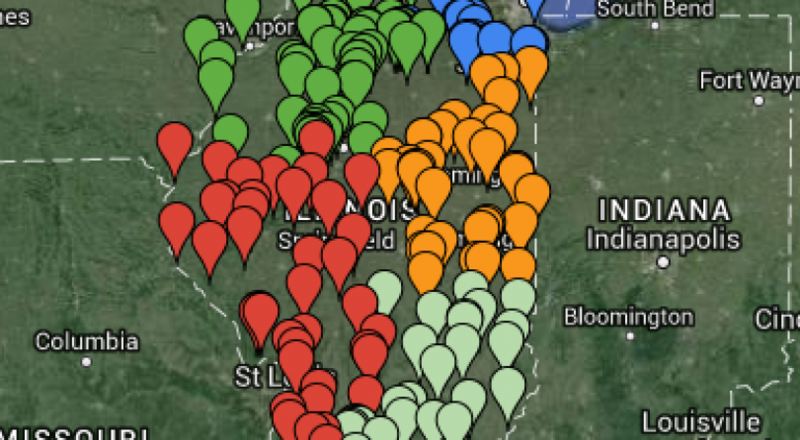 The map is broken into color coded regions, just as the IL DNR page listing is (IL DNR Public Hunting Area Map). Click the menu button in the top left to display a listing of each region and its numerous public hunting areas. Site markers are placed on the map as close to the property locations as possible. However, many sites may also have multiple tracts of land which make up the “area.” Make sure to check the associated site map to ensure proper locations of hunting areas. You can also download a Google Earth .kmz file here. Remember! Please always check with the hunter fact sheet and site office to ensure compliance with any site-specific regulations! Know your property boundaries as well, to ensure you don’t wander onto private land or out of the DNR property. There are limited areas available to the public for hunting in IL, so help keep them around by following all Federal, State, County, and site specific rules. PUBLIC DUCK HUNTING IN ILLINOIS: WHAT DUCK HUNTING CHAT WON’T TELL YOU. Illinois public hunting areas and land map locations in the state with linked hunter fact sheets for site specific information showing where to hunt.